One window used to assess your general health is your poop. The color, texture, odor, and shape of your poop can tell a lot about your health at any given time. Your gut is partly responsible for your overall functioning and well-being. Many of us are in a hurry to finish up with our toilet business, never paying attention to our poop. This is a habit that should change. In this article, we will walk through one of the many poop changes you may notice- sticky poop. We’ll go through different causes of these pasty stools and what you can do next. But first, let’s discuss some basic things about poop briefly. Food in its many forms and combinations is not useful to our body immediately after ingestion. To provide energy and nourishment for the body’s cells, it undergoes several processes to get to the final usable form. These processes occur in the digestive system. By the time food gets to the small intestine from the stomach, it is in a liquid form with many constituents ready to be absorbed by the body. For further digestion, especially of fatty food items, the pancreas and gall bladder pour out chemicals to the small intestine via tubes called ducts. These chemicals aid the digestion of fat. From the small intestine, undigested food moves to the large intestine. In here, the greenish mixture of undigested food is acted on by enzymes and bacteria which turns the blend into brown, the color of normal poop. Water is further removed from the leftover and it becomes a semi-solid sausage-shaped mass, ready for removal. What Causes Sticky or Pasty Poop? Your poop may be a little unlike normal sometimes. This is mostly influenced by your general health and well-being, stress, genetics, diet, and medications. You may notice that your poop sticks to the side of the toilet or hard to wipe when cleaning up, requiring extra effort to be flushed. You should relate all accompanying symptoms to your doctor for a better picture of your health. Your body responds to your food choices. For example, eating a high-fat diet will cause you to have excess fat when food gets digested, leading the body to get rid of the excess fat that it has no use for. This often leads to a bulkier, thicker and stickier poop, looking muddy. It may also lead to a stool color change and have a bad odor. These are of utmost importance in the digestion of fatty food. Bile, produced in the liver and stored in the gall bladder, enters the small intestine via a duct (a tube) and helps to aid the digestion of fats. 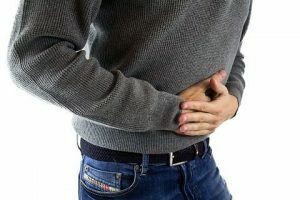 A problem with production (due to Liver disease), storage or transportation (gall bladder stones or a tumor), means that fat digestion will be hindered, leading to sticky or pasty and bulky stools. A problem with the pancreas may also cause fat malabsorption as it is also responsible for fat absorption. While sticky poop may be an immediate but temporary reaction to your food intake, it may be the case every day in some people. In Crohn’s disease, the body finds it harder to absorb fat and this is lost via your poop. Similar to Crohn’s disease, other conditions may cause fat to be improperly digested, like ulcerative colitis. Here, the body is unable to digest gluten. When you ingest food items containing gluten (from typical grains like wheat), it goes through the digestive process relatively unchanged and able to cause poop to become sticky or pasty. Additionally, you may have nausea and vomiting, feeling bloated and diarrhea. In cases of ulceration to the stomach or injury to the esophagus, these organs bleed intermittently. The blood mixes with the fluids in these areas and causes the poop to be sticky and changes its color (turns black due to the action of enzymes and bacteria). In some people, the chemicals necessary to digest milk and other dairy products are ineffective or absent, leading to poor absorption of these food types. This may also cause you to have thick, sludgy, sticky poops but often has other symptoms. In addition to these causes, other illnesses like malaria or dengue fever may cause you to have sticky poops. What Should I Expect From A Visit To My Doctor? If your stools are repeatedly sticky or pasty, you should see your doctor. After the consultation and physical examination are done, your doctor will make a note of what the probable cause of your sticky or pasty poop could be. Usually, there are sufficient details to point to a single offending agent at the end of this process. However, in cases where the diagnosis is unclear or needs confirmation, tests are ordered. Treatment follows diagnosis. It may be as innocuous as a dietary or lifestyle change or as complex as surgery to correct any defects. The following are tips on how you can solve your sticky poop problem at home if you are noticing sticky poops for the first time. Lower your fat intake. Avoid or reduce the ingestion of food items like pizza, butter, oils, red meat, and potato chips. Eat a lot of fruits and vegetables like carrots, oranges, and spinach. If you have celiac disease or lactose intolerance, avoid gluten/dairy products. If the sticky poops persist for more than a few days, or you have accompanying symptoms which are getting worse, you should see your doctor. When left untreated, complications may set in, including the loss of important fat-soluble vitamins A, D, E, and K. Your doctor will tailor treatment to the specific cause(s) of your sticky poops. How Can I Prevent Sticky Poop? A healthy diet with adequate amounts of fruits, vegetables, fiber, and water will go a long way in improving your gut health. You should limit the number of fatty foods and processed foods you ingest. Furthermore, endeavor to exercise as often as possible while getting enough sleep.